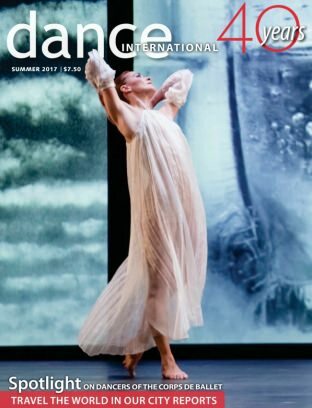 [prMac.com] New York, New York - Canada's Dance International, a magazine devoted to covering contemporary and classical dance from Canada and around the world, chooses Magzter, the world's largest digital magazine newsstand, to increase its digital reader base. Established in 1977 in Vancouver, British Columbia, Dance International is published by the Vancouver Ballet Society. Published quarterly, Dance International features global insight in each beautifully designed issue, and also supports established as well as emerging writers. The magazine's in-depth features and reviews help build a lively conversation around dance. The latest issue of Dance International sheds spotlight on dancers of the Corps de Ballet. "At Magzter, we always strive to add unique magazines to our catalogue, which cater to niche magazine readers possessing diverse interests. In this direction, we are excited to add Canada's Dance International magazine to our catalogue, which is sure to delight the dance enthusiasts around the world." - Girish Ramdas, CEO, Magzter Inc.
"It's a really difficult art to publish a magazine on dance. However, Dance International has been doing it with elan for the past 40 years, thanks to its insightful and diverse columns. We're delighted to have this magazine on board and we'll do all that we can to take it to new geographies and readers." - Vijay Radhakrishnan, President, Magzter Inc.
Magzter - Digital Magazine Newsstand 6.14 is free (with in-app purchases) and available worldwide through the App Store in the News category. Published quarterly, Dance International is priced at CAD 15.99 for an annual subscription on Magzter. Dance International also comes as a treat to Magzter GOLD users, who can enjoy reading it along with 4,000+ other international digital magazines. The Magzter app is also available on the web, Google Play, Amazon App Store, Kindle Fire and is expanding to more platforms soon. Magzter's easy purchase and renewal systems ensure subscriptions are paid on time, eliminating the need for paper checks and postal mail issues. Users can buy their magazines on any of the above devices/platforms and seamlessly port their purchases to any other devices, a feature unique to Magzter.